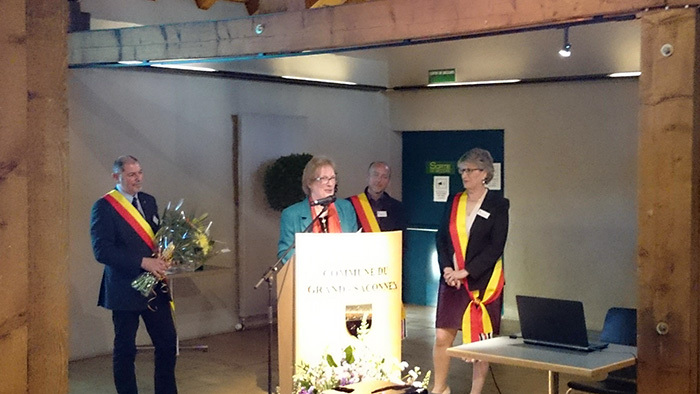 On 22 April 2015, Dr. Heli Bathija, GFMER Director for Knowledge Management and Sharing, received an award from her town of residence, Grand Saconnex. This award was an acknowledgement of Heli’s non-stop hard work and commitment to help women and children. After finishing her job with the World Health Organisation (WHO), Heli established an NGO entitled HOBI (Hope for Babies International). In 2011, through this NGO, she started a knitting group with her two WHO colleagues, Deborah Kioy from Kenya and Chrissie Chizulo from Malawi. As Heli had been very involved with Afghanistan over the years and was aware of the high maternal and infant mortality there, she wanted the baby sweaters to be sent to warm up Afghan babies. Very quickly the knitting group expanded and new groups were formed both in Switzerland as well as in Finland. Through Heli’s friends the message about the project went around the world and individuals got excited about the possibility to contribute meaningfully and started to knit sweaters for Afghan babies. The mayor of Grand-Sacoonex presented the award to Heli during a ceremony that took place on Wednesday, 22 April 2015 in Grand-Saconnex, the town where Heli resides. We encourage Heli to continue her valuable efforts in helping women in need through this pragmatic project. As Heli says, “By knitting and giving the sweaters you do not only help those in need but you also transmit love”.